As of 3rd July, Malta has become the first country to provide a legal framework for businesses working in the blockchain space. That and the friendly political attitude towards blockchain-based companies means that more foreign companies (like Binance) will set up shop in Malta, more local companies (like Intelliblock) will emerge and more opportunities for blockchain developers and consultants, corporate and legal services and marketing services will be there for the taking. If you can identify as one of the above services and aren’t sure how to get started in the blockchain industry, then this article is for you. It will explore what services will be required to sustain this new sector. Who will be regulated by these new bills? The line between Financial Services and Virtual Financial Assets (VFAs) is an important distinction since only VFAs will be regulated by these new bills. The Malta Financial Services Authority (MFSA) have devised a Financial Instrument Test to help distinguish between the two. The proposed test is thorough, but for the purpose of this article we can casually define VFAs to include all traded cryptocurrencies, brokerages, eWallet providers etc. The current blockchain and ICO space is littered with scams, making it difficult for consumers to identify legitimate projects. Malta’s new regulatory laws surrounding the launch of ICOs solves this problem by allowing good intentioned companies to be recognised as such by setting up shop in Malta – where they’ll have to acquire a seal of approval for their ICO from the MFSA. 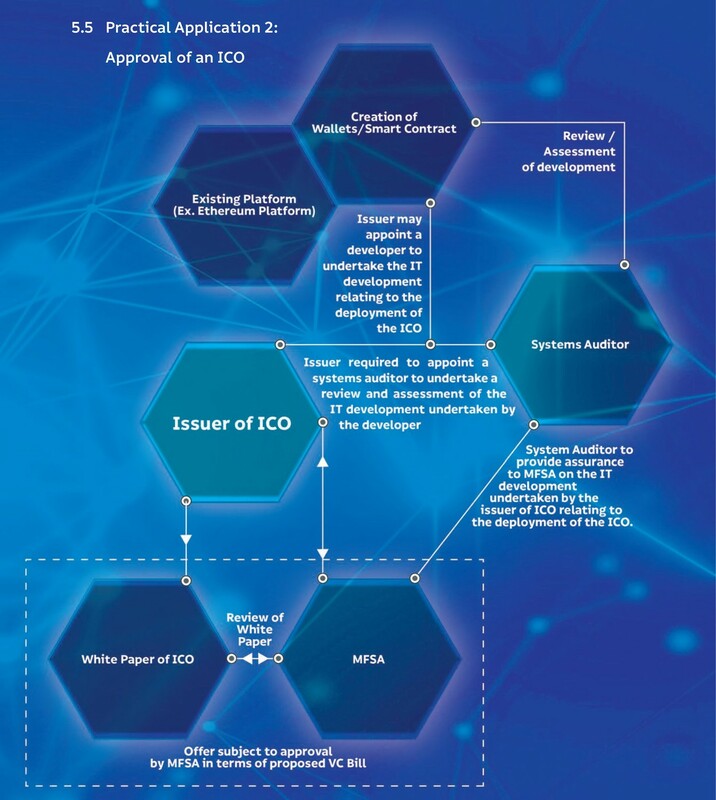 I’ve summarised the process that a company must go through in order to issue an ICO in Malta, below (and have included the flow chart from the “Malta – A Leader in DLT Regulation” document released by the government of Malta). The Issuer is required to appoint a Systems Auditor to undertake a review and assessment of the IT development. The Systems Auditor can act as a consultant during the development process and review and assess the development of smart contracts and/or wallets as they are developed on an existing blockchain platform (e.g. : Ethereum). The Systems Auditor must provide assurance to MFSA on the IT development undertaken by the Issuer relating to the deployment of the ICO. The Issuer must provide a whitepaper to the MFSA, which must be reviewed and approved (in terms of proposed VC Bill). From the approval steps above, we can identify a number of services required. ICO issuers won’t necessarily be tech companies and might need to outsource the actual development. Even if the company has an in-house development team, a consultant might still be required to help guide the development team or write the whitepaper. By law, an external auditor must be appointed in order to obtain approval from the MFSA. The auditor will need to know the ICO regulations inside out and should have the technical expertise necessary to audit the code and oversee the development process. DLTs remove the need for a “trusted intermediary” between two parties by introducing the concept of smart contracts to independently ensure that both parties uphold their end of the deal. Smart contracts must be honest, robust and hardened – all aspects that can be verified by a proficient blockchain developer due to the open sourced nature of smart contracts. Even though it’s possible for anyone to read the code of a smart contract to verify its correctness, it’s unfeasible to expect people to do so. Here enters the soon to be created Malta Digital Innovation Authority (MDIA), who will provide DLT platforms certifications denoting that their product has passed the MDIA’s criteria for correctness. I’ve summarised the process that a company must go through in order to get their DLT platform certified by the MDIA, below (and have included the flow chart from the “Malta – A Leader in DLT Regulation” document released by the government of Malta). Note that in order to make the bill more future proof, the term “Technology Arrangement” is used instead of “DLT Platforms” so as to be able to eventually cover more technologies (like AI). Employ an Administrator of Technology Arrangements to manage the technology arrangement. The Administrator must seek registration with MDIA. The Administrator must appoint a System Auditor to undertake a review and assessment of the technology arrangement. The System Auditor must provide assurance to MDIA on the quality and characteristics of the technology arrangement. 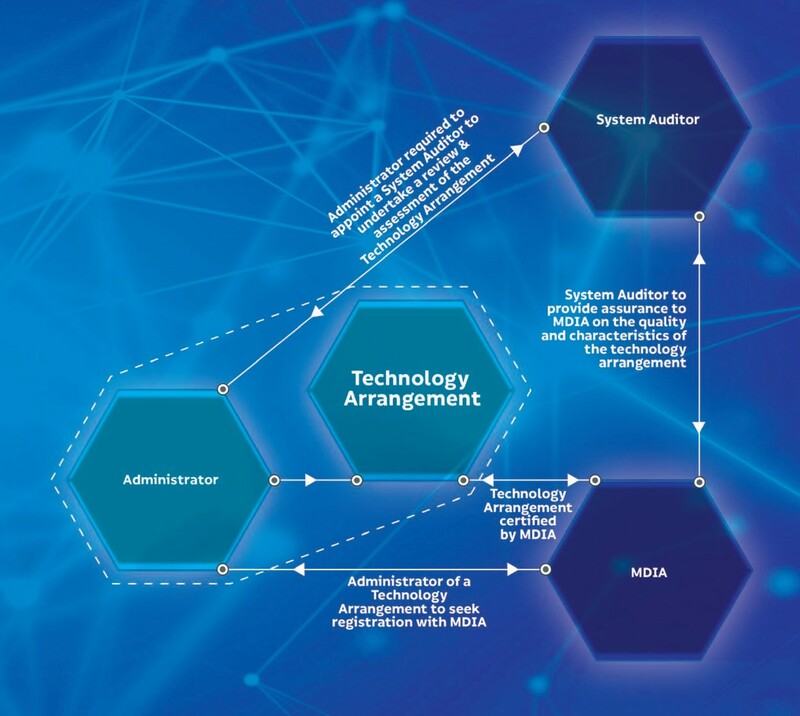 After being successfully audited, the MDIA will certify the technology arrangement. Apart from the Systems Auditor who would play a similar role as in an ICO approval, you’ll notice the introduction of the new “Administrator of Technology Arrangements” designation. These administrators (like the auditors) are official roles that must be certified in order to be recognised by the MFSA and the MDIA. Apart from the skilled workers required to help companies launch ICOs and DLT platforms, a number of other sectors will indirectly benefit from Malta becoming a Blockchain Island. Malta currently has one of the most advanced legal frameworks for blockchain based companies making it an attractive place for companies to relocate to or set up shop here from scratch. New companies need to be set up that will also require financial services. New companies with new products need new customers, acquired through marketing. DLTs are disruptive, since they provide new solutions to old problems, but sometimes it’s hard to see the DLT solution. Strategy consultants can help to identify areas in your business that can benefit from DLTs. With any luck, I’ve been able to shed some light on what the future of the Blockchain Island will bring. If you’re looking for some more inspiration and resources to keep updated in the space, I’ve compiled a shortlist of people and projects to follow to help you stay connected. Follow me on Twitter for more updates @Michael Stivala.